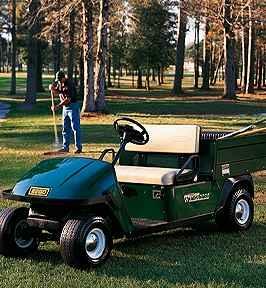 It is a good idea if you own an E-Z-GO to identify the model and year of manufacture. This can be done by finding the Serial Number and the Manufactures Code. 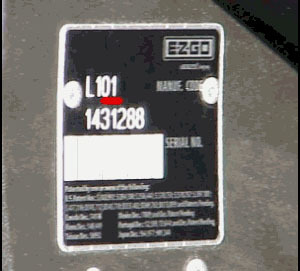 Most modern (76-present) E-Z-GO cars have their Serial Number & Manufactures Code in or under the passenger side dash board looking toward the center of the car. The specific order of the numbers changes over the years but the Code always has a letter and the last two (2) digits of the year it was made incorporated in the overall series of numbers. The actual Serial Number is either 6 or 7 numbers (only) and it does not indicate the model year. Prior to ’76 the SN plate was under the driver’s side seat, just behind the most driver side battery, on the fender skirt. The date determination on these early models is somewhat mysterious so tell us the numbers and we’ll help decipher them. Please include all the letters and numbers found in these locations when ordering any parts. 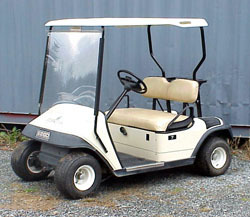 In the mid-2000’s, E-Z-GO changed the format and location of their vehicle information. 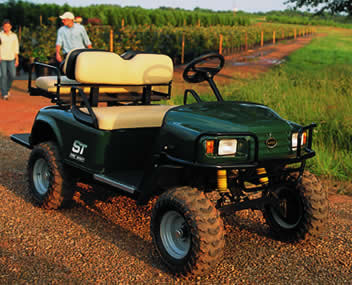 They no longer included the manufacturer’s code, and instead of a plate inside the passenger’s side dash compartment, they simply apply a sticker under the choke plate (on gas carts) or under the charger receptacle (electric carts). This system is much harder to decipher. 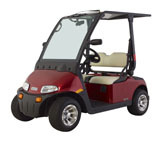 If you have any questions regarding the year and model of your E-Z-GO, please give us a call. This section is always under construction, so feel free to email any pictures or information about your E-Z-GO. 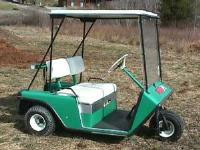 E-Z-GO Golf Car Co. was founded in 1954 by two brothers, Beverly and Billie Dolan, in Augusta, GA. 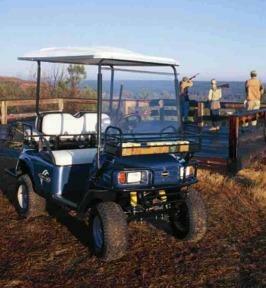 They started in a small machine shop and today E-Z-Go is one of the leading golf car manufacturing companies in the world. 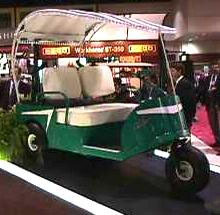 Pictured here is a restored version of the original electric golf car produced in 1954. 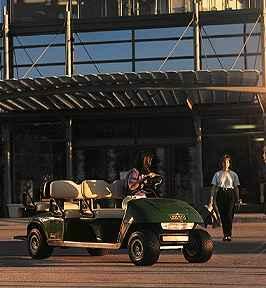 It was taken at the 1999 PGA Show in Orlando, FL. 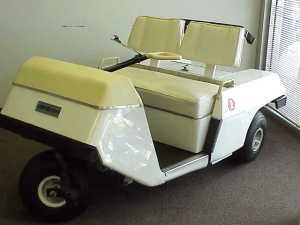 Also pictured here is an early E-Z-GO Model 400 taken at the Augusta, GA E-Z-GO Branch Office. We’re not really sure exactly when this body style and top debuted. 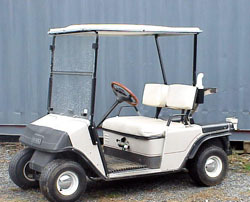 Pictured is the ‘Classic’ E-Z-GO 3 wheel golf car with the factory made 48″ long x 42″ wide ‘X’-Leg top. The top is characterized by the round steel posts, painted black, and the rear legs form an ‘X’ when viewed from the side. It could support itself from the rear ‘X’ legs only. The early models had a single post in the front and later on, as windshields became more common, 2 round posts supported the front of the top and the windshield attached to them. This top design was common on some early Melex golf cars and I have seen it on other cars too. This top had a brittle ABS plastic insert that is no longer available. The basic design of this car was also offered in a 4 wheel version with the same top. In 1974 a gasoline 2 cycle engine was introduced. Prior to ’74 a 36- volt electric drive train was all that was made. In 1980 E-Z-GO had several changes to the basic car. Key among them was the ‘X’-Leg top was discontinued and the new top was lengthened to 54″ (from 48″). The top support posts went from round to 1″ square in the rear and 3/4″ square in the front. The front legs were required as the top could not hold itself up from the rear ‘X’-Leg any longer. NOTE: The front support legs bolt onto the TOP of the front cowl. This is important if you wish to buy a windshield or rain curtain for this model. The 4 wheel front suspension was changed to a solid tubular axle with built-in kingpins and short front to rear leaf springs. The old leaf spring that extended from wheel to wheel went away. The seat back/bag rack support bracket was changed and it helped to support the rear top. They still made 3 & 4 wheeled cars and the electric stayed pretty much the same. The gasoline engine changed from an internal (inside the engine) to an external Hitachi starter generator. Other changes were made to the gas engine and to the brake system. 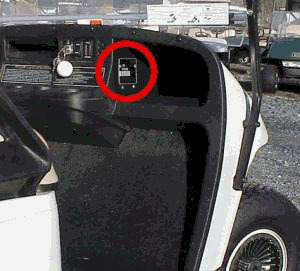 The E-Z-GO golf car changed a lot in the years 1986 through 1994. Several important changes occurred in 1986. Most notable was the widening of the windshield support legs and the way they attached to the car. The support legs were bolted to the OUTSIDE of the front cowl (see picture) rather than to the TOP of the cowl as in the 80-85 models. The factory windshield frame was still made from ¾” square tubular steel, painted black. 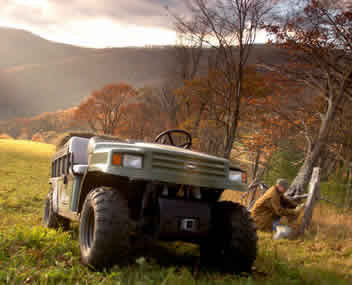 The wider frame required a wider windshield. The top dimensions did not change; they stayed 42” wide x 54” long. NOTE: This windshield frame (front top support) could be retrofitted to older cars than the ’86 model. Also the older, narrower frame could be used on cars built after 1986. It is very important to check which front frame you have on the car if you wish to order a windshield or a rain curtain. 1986 also saw the introduction of the ‘Spirit’ and ‘Liberty’ models. These cars sported an automotive style front cowl & bumper finished with recessed head & tail lights and wrap around windshield. They were powered with the standard 2 cycle gas engine or the 36-volt electric system. 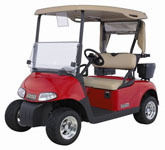 The 2 seat ‘Spirit’ was identical to the regular golf car except for the classy front end and electrical package. The ‘Liberty’ was actually an upscale 4 seat personnel carrier with 2 passengers facing rearward. It had all the custom ‘Spirit’ features and a long top could be fit to the car that covered all riders. 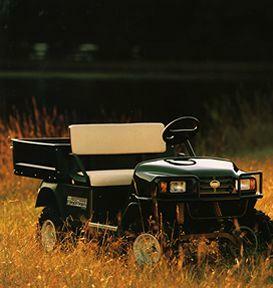 This model was discontinued in the early 90’s, but there were more changes to come in the E-Z-GO cars. The Medalist model was the successor to the boxy “X Car”, or Marathon, as many people called it. 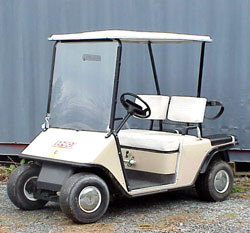 In 1994 both the Medalist and the ‘X-Car’ models, in both gas and electric versions, were produced for sale. If your car is made in 1994 it could be either model. Please read the following descriptions carefully to determine which you have. The Medalist was the first departure from the old look and frame that had been around forever. It had an entirely different, robot welded frame and a new rounded body style. The metal body was offered in many different colors. A new headlight bar that fit under the front cowl was standard equipment on the Freedom model Medalist cars. The factory top has handles built right into it, just above the rider’s heads. A one piece seatback assembly replaced the older two seatback arrangement. The dash compartment was made significantly smaller. Very few body parts interchange with the older ‘X-Car’. The drive train and brakes of the gas & electric cars did not change much but almost everything else did. 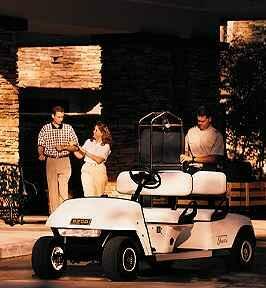 In 1996 E-Z-GO changed the body material to a composite thermoplastic finished with a paint and clear coat. The drive train and frame remained the same, only the body material and some trim changed. The TXT body will retrofit onto the Medalist frame. In 1995 the regenerative braking DCS car was rolled out. This car had an electronic speed controller that allows the motor to work as a generator when rolling downhill. This actually recharges the batteries and by design the regeneration acts as a brake, or governor of sorts, on the top speed of the motor. This system has the distinct advantage of being able to preset the top speed of the car electrically, no brake pedal needed. This same technology also allowed the car to go faster uphill. The regen capabilities of the system are not very efficient as far as a full recharge but it certainly provides enough regeneration to control the top speed. In 2000 E-Z-GO brought out the next generation speed controller dubbed the ‘PDS’. This system is programmable and it features 4 different regen ‘personalities’. 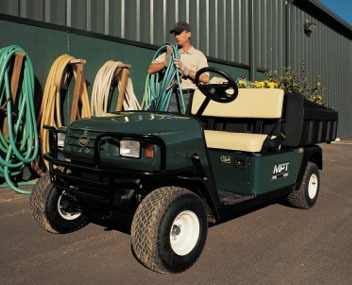 You can read more about this system under E-Z-GO in our Industry News Section. NOTE 1: There is no way to override or disable the regen feature of the DCS car. If you have it and don’t like it…sell it! NOTE 2: The TXT is offered in the Freedom model with head, tail and brake lights, electric horn, and a gas gauge/low oil light or battery charge indicator on the dash. 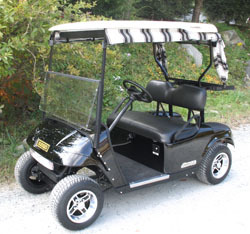 This entry was posted in Golf Cart Museum and tagged 2FIVE, 4 caddy, 6 caddy, 800, clays car, e-z-go, EZGO, freedom, golf cart museum, liberty, marathon, medalist, mpt 1000, mpt 1200, mpt 800, rxv, spirit, st 4x4, st sport 2+2, st350, st480, terrain, txt, workhorse, workhorse 1200, x-car by Michael Williams. Bookmark the permalink.